The new book tells of the bloody 29-day battle to liberate Manila, in which an estimated 100,000 civilians lost their lives. A new book has been published that reveals the full horror of the World War Two battle to liberate Manila from the Japanese. In February 1945, Japanese troops committed one of the worst massacres of the war, slaughtering an estimated 100,000 Filipino men, women and children. 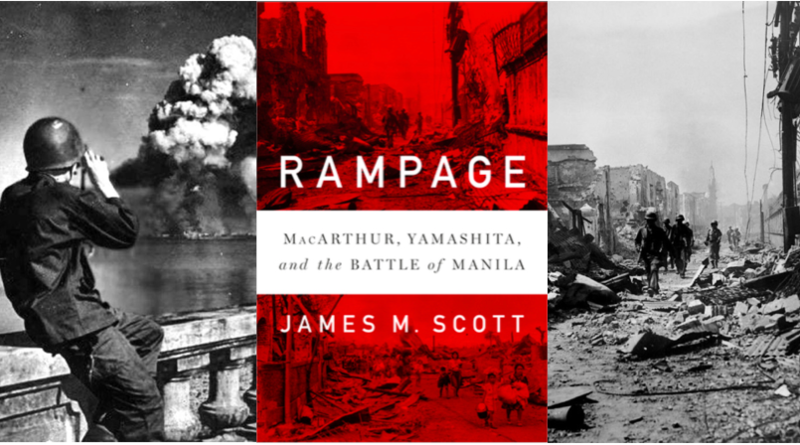 Author James M Scott said: “It is a story few people remember — but one I resurrect in my new book Rampage: MacArthur, Yamashita and the Battle of Manila. The crimes committed during the 29-day battle included locking thousands of civilians inside homes and social halls before setting them on fire. Troops also raped women and tossed infants in the air, skewering them on the blades of their bayonets. In one of the more gruesome accounts, Japanese marines cut a hole in the second floor of a Manila home and then led blindfolded individuals upstairs, forced them to kneel, and decapitated them with swords. Two hundred men were said to have died in this way. Mr Scott began his research at the National Archives in Washington, digitising thousands of victim affidavits. These statements, often recorded on deathbeds, were intended for potential use in war crimes trials. He said: “I digitised records at a rate of almost 4,000 pages a day. I ultimately created a database, logging the gruesome details of what each survivor endured. “I married months of archival work with field research in the Philippines, interviewing survivors and visiting many of the 27 major atrocity sites in Manila in order to accurately recreate those scenes. “I walked the hallways of the University of Santo Tomas, where American internees starved to death at the rate of three to four a day before Sherman tanks broke down the gates and liberated the nearly 3,700 captives. “I peered into the dungeons of Fort Santiago, the infamous Japanese torture centre where American troops found hundreds of dead civilians stacked several deep. Rampage: MacArthur, Yamashita and the Battle of Manila is published by W W Norton and costs $32.95 (hardcover). To order, visit the publisher’s website. In 1976, I brought my wife to the U.S. from the Philippines, we had a large family gathering, and my whole family met my sweet little wife. One of my uncles smiled at her and said, “I was in the Philippines”. I looked at him strangely, because I never knew that. He then got teary eyed and told us, he landed with the 148th Inf Div (Yes, we’re Buckeye’s). He said threw his year long of “Island hoping”, this was the worst horrors he had ever seen. Seeing my wife’s beautiful smile, warmed his heart. Could somebody recommend a book that I could read about the Philippine-American War?